Aim: The aim of this study was to compare the canal transportation, canal centering ability, and time taken for preparation of curved root canals after instrumentation with ProFile GT Series X (GTX) files, Revo-S files, twisted files, and Mtwo files by using cone-beam computed tomography (CBCT). Materials and Methods: Forty mesiobuccal canals of mandibular molars with an angle of curvature ranging from 20 to 40 were divided according to the instrument used in canal preparation into four groups of 10 samples each: GTX (group I), Revo-S (group II), twisted file (group III), and Mtwo (group IV). The teeth were instrumented according to manufacturer's guidelines, with all groups being prepared to size 30, 0.06 taper master apical file. Canals were scanned using an i-CAT CBCT scanner (Imaging Science International, Hatfield, PA, USA) before and after preparation to evaluate the transportation and centering ratio at 3 mm, 5 mm, 7 mm, 9 mm, and 11 mm from the apex. The data collected were evaluated using one-way analysis of variance (ANOVA) with Tukey's honestly significant difference (HSD) test. 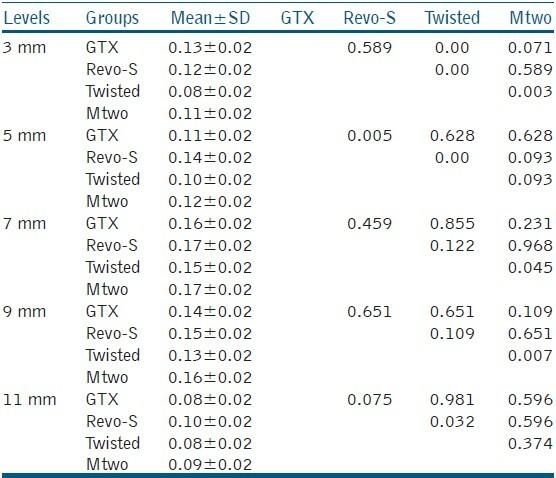 Results: Twisted file system showed significantly least canal transportation and highest canal centering ability values as compared to GTX, Revo-S, and Mtwo file systems. Overall, GTX, Revo-S, and Mtwo showed comparable results with respect to canal transportation and centering ability. Conclusion: The innovative method of manufacturing the TF system resulted in superior shaping ability in curved canals, with the instruments remaining more centered and producing less canal transportation than GTX, Revo-S, and Mtwo file systems. Cleaning and shaping of the root canal system is an essential part of root canal therapy. The primary goals of cleaning and shaping are thorough debridement of the root canal system and specific shaping of root canal preparation, while maintaining the original canal configuration and optimal canal form. However, this is difficult in curved canals, where there is a tendency for all instrumentation techniques to change canal curvature and result in procedural errors. The evolution of nickel titanium rotary instrumentation and its metallurgy has resulted in reducing the procedural errors associated with root canal instrumentation and the time required to finish the preparation. The Mtwo endodontic instruments introduced in 2005 have two blades and feature a large groove between them. This design is claimed to reduce the core diameter and increase the ﬂexibility. Furthermore, the increasing pitch allows a more delicate cutting action at the apex and a more aggressive one in the coronal portion. There have been no studies published till date on the use of cone-beam computed tomography (CBCT) to assess and compare the canal transportation, centering ability of Mtwo files with that of RS files, TF, and GTX files in curved extracted mesiobuccal root canals of mandibular molars. Thus, the purpose of this study was to evaluate and compare the canal transportation, canal centering ability, and time taken for preparation of curved root canals after instrumentation with Mtwo files, RS files, TF, and GTX files by using CBCT. Forty extracted human mandibular first molars with an average length of 20-21 mm, curved mesial roots with two separate mesial canals and apical foramina were selected. Teeth were accessed using an Endo-Access bur (Dentsply, Maillefer), and the meisobuccal canals were localized and explored with a size 10 K-file (Dentsply, Maillefer). Mesiobuccal canal curvatures were assessed according to Schneider's technique. Only canals with curvature (20-40) were included in the study. Distal roots with the respective part of the crown were sectioned at the furcation level and discarded. The determination of the working length was performed at magnification 8Χ using a surgical microscope by inserting #10 K-file to the root canal terminus and subtracting 1 mm from this measurement. Specimens were coded and randomly divided into four equal experimental groups (n = 10) according to the rotary NiTi file system used in canal instrumentation: The RS group, the TF group, the GTX group, and the Mtwo group. For all the groups, the root canal instrumentation was performed in accordance with the manufacturer's recommendation for all the files. All the files were operated by a 16:1 gear reduction handpiece powered by electric torque control motor and the final apical preparation was standardized to size 30 with 0.06 taper. Canals were irrigated with 3 ml of 5% NaOCl solution after use of each file. Glyde (Dentsply, Maillefer, Ballagius, Switzerland) was used as a lubricant during instrumentation. Final irrigation was done with 1 ml of 17% ethylenediaminetetraacetic acid for 1 min followed by a final flush of 3 ml of NaOCl. The instrument was changed after preparation of three canals. The roots were positioned in a custom-made specimen holder in which they were aligned perpendicularly to the beam and scanned before and after instrumentation using i-CAT CBCT scanner (Imaging Science International, Hatfield, PA, USA). The teeth were then scanned to determine root canal shape at 3 mm, 5 mm, 7 mm, 9 mm, and 11 mm from the apex. After obtaining scans from all specimens, the data from CBCT were stored in magnetic optical disc. The shortest distance from the canal wall to the external root surface was measured in the mesial and distal directions for the mesiobuccal root canal. The distance was measured on the reconstructed 2-dimensional image without reduction by using the measure length tool. Measurements were recorded before and after instrumentation to calculate the following: (1) The degree of canal transportation at each level according to the following formula: (x1 − x2) - (y1 − y2); (2) The canal centering ratio at each level according to the following ratio: (x1 − x2)/(y1 − y2) or (y1 − y2)/(x1 − x2), where x1 is the shortest distance from the mesial edge of the root to the mesial edge of the uninstrumented canal, x2 is the shortest distance from the mesial edge of the root to the mesial edge of the instrumented canal, y1 is the shortest distance from the distal edge of the root to the distal edge of the uninstrumented canal, and y2 is the shortest distance from the distal edge of the root to the distal edge of the instrumented canal; (3) The mean working time was recorded using an electronic stopwatch. Time for instrument changes and irrigation was excluded. The mean, standard deviation, minimum and maximum values were calculated for all the groups in terms of canal transportation, canal centering ability, and time taken for preparation. One-way analysis of variance (ANOVA) with Tukey's honestly significant difference (HSD) was applied to make inter- and intra-group comparison of canal transportation, canal centering ability, and also the inter-group comparison of the time taken for preparation, using SPSS version 15.0. A P 0.05 was considered as statistically significant level. The mean and standard deviation values for the canal transportation and the centering ratio at the studied levels for the experimental groups are presented in [Table 1] and [Table 2], and the time taken for preparation in [Table 3]. At 3 mm, GTX showed maximum transportation and minimum canal centering ability (0.13 ± 0.02 and 0.72 ± 0.03) as compared to RS (0.12 ± 0.02 and 0.73 ± 0.03), TF (0.08 ± 0.02 and 0.83 ± 0.03), and Mtwo (0.11 ± 0.02 and 0.73 ± 0.04). At 5 mm, RS showed significantly higher mean canal transportation and lower canal centering ability (0.14 ± 0.02 and 0.70 ± 0.04) than GTX (0.11 ± 0.02 and 0.77 ± 0.06) and TF (0.10 ± 0.02 and 0.77 ± 0.05), while the difference between RS (0.14 ± 0.02 and 0.70 ± 0.04) and Mtwo (0.12 ± 0.02 and 0.73 ± 0.04) was not significant. At 7 mm, TF showed significantly lower mean canal transportation and higher centering ability (0.15 ± 0.02 and 0.69 ± 0.04), as compared to Mtwo (0.17 ± 0.02 and 0.60 ± 0.03), while the differences between TF (0.15 ± 0.02 and 0.69 ± 0.04), GTX (0.16 ± 0.02 and 0.64 ± 0.02), and RS (0.17 ± 0.02 and 0.62 ± 0.03) were not statistically significant. At 9 mm, TF showed significantly lower mean canal transportation and higher centering ability (0.13 ± 0.02 and 0.76 ± 0.03), as compared to Mtwo (0.16 ± 0.02 and 0.71 ± 0.04), while the differences between TF (0.13 ± 0.02 and 0.76 ± 0.03), GTX (0.14 ± 0.02 and 0.75 ± 0.03), and RS (0.15 ± 0.02 and 0.73 ± 0.03) were not statistically significant. At 11 mm, TF had significantly lower mean canal transportation and higher centering ability (0.08 ± 0.02 and 0.85 ± 0.03) value as compared to RS (0.10 ± 0.02 and 0.78 ± 0.04), while the differences between TF (0.08 ± 0.02 and 0.85 ± 0.03), Mtwo file (0.09 ± 0.02 and 0.80 ± 0.03), and GTX file (0.08 ± 0.02 and 0.82 ± 0.03) were not significant. TF showed significantly lower mean preparation time (26.70 ± 1.34) as compared to all other groups, while the differences between GTX (57.20 ± 6.29), RS (54.00 ± 3.43), and Mtwo (56.00 ± 2.45) were not significant. In the present study, TF showed lower value of canal transportation and higher degree of centering ratio as compared to RS and Mtwo, which could be attributed to the new manufacturing method of TF resulting in increased phase transformation temperatures and increased ﬂexibility of TF compared with the other NiTi instruments manufactured by grinding. Also, the single length preparation in case of Mtwo as compared to crown down preparation in case of TF might also have contributed to more canal transportation and lower canal centering ability of Mtwo as compared to TF. The present finding is in accordance with the study of Hashem et al., Gergi et al.,  and Batouty et al.,  who found that TF resulted in more centered preparation with less canal transportation than the other files systems tested. GTX files showed inferior overall average mean values of canal transportation and canal centering ability as compared to TF, but the difference in canal transportation value was significant only at 3 mm, while the difference in centering ratio was significant at 3 mm, 9 mm, and 7 mm. Similar findings were reported by Hashem et al., who also found no statistically significant difference in mean canal transportation of GTX and TF at 5.2 mm and 7.8 mm. GTX showed lower value of canal transportation and higher value of canal centering ability as compared to RS. However, the difference was statistically significant only at 5 mm. The comparable apical transportation and mean centering ability of RS with GTX might be due to asymmetrical cutting profile of RS which facilitates penetration by a snake-like movement and offers a root canal shaping and apical finishing that is closely adapted to the anatomical and ecological criteria of the canal. Hashem et al. have also reported that GTX showed lower canal transportation and higher canal centering ability than RS at 5.2 mm. GTX showed lower value of canal transportation and better centering ability as compared to Mtwo. But the difference in canal transportation was not significant at all levels, while the difference in canal centering ratio was significant only at 9 mm. The comparable values of canal transportation and canal centering ratio of GTX and Mtwo might be due to the single length preparation technique used in both groups and unique design of Mtwo. Maitin et al. have also reported lowest value for canal transportation as compared to Protaper, K3, and Race . GTX showed maximum transportation and minimum centering ability at 3 mm as compared to all other groups. This might be due to the absence of intermediate size between size 20 with 6% taper and size 30 with 6% taper in the GTX file system. All other systems tested in the present study had an intermediate size 25 in their sequence, which might have resulted in their lesser transportation and higher centering ability at 3 mm. The present finding is in accordance with the study of Hashem et al., who found that GTX recorded significantly higher mean canal transportation than RS and TF at 2.6 mm. There have been no studies published till date comparing canal transportation and centering ability of Mtwo produced by traditional NiTi grinding process with the instruments produced by using the twisting method (TF), RS, and M-wire alloy (GTX). Therefore, findings of this study cannot be corroborated or contradicted. Another interesting finding of the present study was that canal transportation at 3 mm of all Ni Ti rotary instruments tested was in the range of 0.08-0.17. These values were considerably less than the critical canal transportation value of 0.3 mm as proposed by Wu et al., who found that leakage occurs more frequently when apical transportation index is >0.3 mm. Intra-group comparison showed maximum transportation and minimum canal centering ability at 7 mm and 9 mm across all groups, which is in accordance with previous studies. TF showed minimum time taken for preparation than GTX, RS, and Mtwo. The significantly less time taken for preparation in TF as compared to RS, GTX, and Mtwo might be due to less number of files and high speed of rotation used during instrumentation. 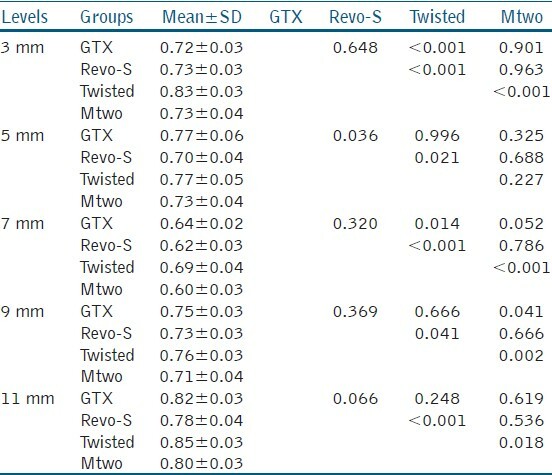 However, there was no significant difference in the mean preparation time of GTX, RS, and Mtwo. Within the parameters of this study, it could be concluded that all the tested files showed some degree of apical canal transportation, but it was well within the acceptable limit (0.3 mm) of canal transportation. The innovative method of manufacturing the TF system resulted in superior shaping ability in curved canals, with the instruments remaining more centered and producing less canal transportation than GTX, RS, and Mtwo file systems. 1. Schilder H. Cleaning and shaping the root canal. Dent Clin North Am 1974; 18:269-96. 2. Gambarini G, Grande NM, Plotino G, Somma F, Garala M, De Luca M, et al. Fatigue resistance of engine-driven rotary nickel-titanium instruments produced by new manufacturing methods. J Endod 2008; 34:1003-5. 3. Larsen CM, Watanabe I, Glickman GN, He J. Cyclic fatigue analysis of a new generation of nickel titanium rotary instruments. J Endod 2009; 35:401-3. 4. Gambarini G, Gerosa R, De Luca M, Garala M, Testarella L. Mechanical properties of a new and improved nickel-titanium alloy for endodontic use: An evaluation of file flexibility. Oral Surg Oral Med Oral Pathol Oral Radiol Endod 2008; 105:798-800. 5. Buchanan S. The technique for GT Series X rotary shaping files. 2009. Available from: http://www.endobuchanan.com. [Last accessed on 2011 Sep 1]. 6. Basrani B, Roth K, Sas G, Kishben A, Peter O. Torsional Profiles of new and used Revo-S rotary instruments: An in vitro study. J Endod 2011; 37:989-92. 7. Schneider SW. A comparison of canal preparation in straight and curved root canals. Oral Surg Oral Med Oral Pathol 1971; 32:271-5. 8. Kandaswamy D, Venkateshbabu N, Porkodi I, Pradeep G. Canal-centering ability: An endodontic challenge. J Conserv Dent 2013; 12:3-9. 9. Gambill JM, Alder M, Del Rio CE. Comparison of nickel titanium and stainless steel hand-file instrumentation using computed tomography. J Endod 1996; 22:369-75. 10. Rhodes JS, Ford TR, Lynch JA, Liepins PJ, Curtis RV. Micro-computed tomography: A new tool for experimental endodontology. Int Endod J 1999; 32:165-70. 11. Gluskin AH, Brown DC, Buchanan LS. A reconstructed computerized tomographic comparison of Ni Ti rotary GT files versus traditional instruments in canals shaped by novice operators. Int Endod J 2001; 34:476-84. 12. Khademi A, Yazdizadeh M, Feizianfard M. Determination of the minimum instrumentation size for penetration of irrigants to the apical third of root canal systems. J Endod 2006; 32:417-20. 13. Hashem AA, Ghoneim AG, Lutfy RA, Foda MY, Omar GA. Geometric analysis of root canals prepared by four rotary NiTi shaping systems. J Endod 2012; 38:996-1000. 14. Gergi R, Rjeily JA, Sader J, Naaman A. Comparison of canal transportation and centering ability of Twisted Files, Pathﬁle-ProTaper system, and stainless steel hand K-ﬁles by using computed tomography. J Endod 2010; 36:904-7. 15. Batouty KM, Elmllab WE. Comparison of canal transportation and changes in canal curvature of two nickel-titanium rotary instruments. J Endod 2011;37:1290-2. 16. Oliveira CA, Meurer MI, Pascoalato C, Silva SR. Cone beam computed tomography analysis of the apical third of curved roots after mechanical preparation with different automated systems. Braz Dent J 2009; 20:376-81. 17. Maitin N, Arunagiri D, Brave D, Maitin SN, Kaushik S, Roy S. An ex vivo comparative analysis on shaping ability of four NiTi rotary endodontic instruments using spiral computed tomography. J Conserv Dent 2013; 16:219-23. 18. Wu MK, Fan B, Wesselink PR. Leakage along apical root filling in curved canals. Part I Effects of apical transportation on seal of root Fillings. J Endod 2000.